Can it really be more than seven years since I first set eyes on the Audi A7 Sportback? Hard to believe, but it was way back in September 2010, wn the Italian island of Sardinia, that I stepped off a flight from Munich to be met by a score of the low, long and rakish five-door coupes lined up at the airport in the afternoon sun, all fuelled up and ready to go. We’d each grabbed a key, climbed aboard our assigned Audi and driven more or less in convoy towards the glamorous Costa Smeralda – a billionaires’ playground made famous by the Aga Khan in the 1960s and caressed then as now by an improbably blue Mediterranean – there to caper for a couple of days in the company of this handsome automobile. Leap forward a generation to February 2018 and there’s a strong sense of déjà vu. We’re facing rows of brand-new A7s that stand baking beneath a cloudless summer sky in a location equally spellbinding, only this time we’re at the edge of the cerulean South Atlantic, in Cape Town to be precise. And if bells are tinkling insistently in my ear, then that’s also because on first glance this latest iteration of Audi’s full-size fastback appears to be cut from an almost identical template to that of its predecessor – meaning that though it’s still dramatic and well proportioned, it also riffs on a familiar theme that harks all the way back to the company’s 100 Coupe of the 1960s. There’s no doubt the new A7 is a looker, though, and a more thorough perusal of its athletic silhouette reveals flourishes and embellishments that should carry both concept and design well into the mid-2020s. The wider and more angular single-frame grille, for example, which was previewed on the Prologue concept coupe of 2014, suggests a lower and more aggressive stance than the original’s, while the rear haunches hint at the Coke-bottle voluptuousness of ’60s and ’70s muscle cars, not to mention the flared wheel arches of Audi’s outgoing high-performance variant, the RS7. Need further visual clues that this is the second-gen car and not the first? 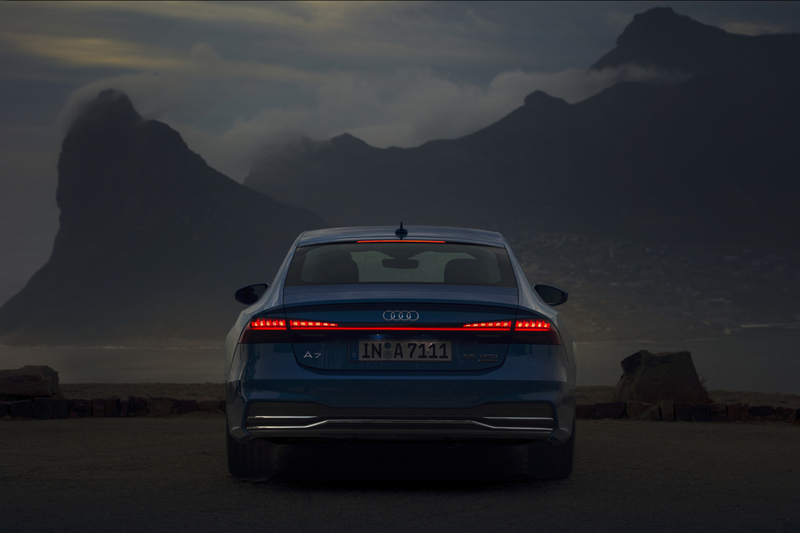 Look no further than the rear lights, each made up of 13 elements that indicate direction changes sequentially and are linked by an illuminated strip; the sculpted swage lines that give definition to the curved side surfaces; and – to quote the press release – a tail “tapered like that of a yacht”. If in 2010 I’d been impressed by the Sportback’s exterior styling, I’d been blown away even more by the interior’s glorious juxtaposition of superb ergonomics, fine leather, metals and wood, excellent build quality and a comprehensive multimedia and navigation system whose logic and ease of use I’d never before experienced. Even more astounding to me then were both the manner in which the latter’s screen rose up from the centre of the fascia and the satnav’s Google Earth-enhanced roadmaps (a feature some other manufacturers have yet to get their heads around even today). But what a difference the intervening years have made, for in comparison the sleek, airy and roomy cabin of the 2018 car – whose geometric horizontals and angles, and no fewer than three gleaming slabs of TFT display, reference those of the bigger A8 – is positively space age. A contemporary design statement in soft Valcona hide, grey aluminium and panels of shiny black – I search in vain for cheap plastics or, indeed, inferior materials of any kind – it seduces tech heads with brightly coloured screens and haptic glass “buttons”, and matches the competition from Stuttgart with a rainbow of ambient-lighting hues. The seats, excellent both front and back, are built for hour-upon-hour of occupancy – and even in the rear, where the sloping roofline admittedly compromises headroom, there’s plenty of usable space. Old-school luxury they most certainly aren’t, but cool, modernist surrounds such as these are catnip to the average Audi buyer and hit the spot bang on. Delving deeper beneath the new A7’s skin, the similarities with the 2018 A8 become even more pronounced, from the shared steel-and-aluminium construction to the 48-volt electrical system, the mildly hybridised powertrain and the options of adaptive air suspension, rear-axle steering and a host of advanced driver-assistance technologies. And just like the A8 we drove only months ago in Spain, our fully loaded A7 Sportback 55 TFSI is powered by a turbocharged 3-litre V6 petrol engine that produces 335bhp and 500Nm of torque, the latter from as low as 1,370 right up to 4,500rpm. That grunt – not exactly a tidal wave, but hefty enough nonetheless – reaches the tyres via a fast and snappy seven-speed dual-clutch gearbox and a brainy quattro all-wheel-drive system, which only diverts power to the back end if it senses the potential for catastrophe. The A7 can be optioned with so much smart tech that you could, should local legislation permit, let it handle the driving chores, but on this occasion, we’re focused on doing the work ourselves – and that’s all for the better. As we’ve seen, the cabin of Audi’s biggest Sportback is pretty spiffy no matter where you choose to park your backside, but behind the small, flat-bottom steering wheel is where you’ll really want to sit: with that trio of Virtual Cockpit screens angled straight at you, this is one properly driver-focused environment (and for those who baulk at Benz’s slender column-mounted transmission selector, the Audi’s properly chunky item is located exactly where head and hand think it ought to be: on the console). In spite of the car weighing more than 1.8 tonnes, the punchy 3-litre can move it pretty briskly, with 100km/h reached from a standstill in 5.3 seconds and maximum speed limited to the Germans’ customary 250. Thanks to a combination of superior aerodynamics, enhanced soundproofing and the silken hybridised engine, however, the cabin is also amazingly silent, so I constantly find I’m travelling more rapidly than the aural inputs suggest; invest in the head-up display is my advice to the throttle-happy. I said silent, but not all roads around Cape Town are like snooker tables and even with the air suspension set to Comfort I’m experiencing some audible thump from the test car’s 21-inch alloys, on which the rubber is so low profile it might as well have been painted; for daily urban use you’d probably be more comfortable with downsized rims and plumper tyres. And as the reduced suspension travel of our S line test car necessarily entails a firmer ride, air springs are a must-tick option that the considerate folk at Audi have also provided. For more precise body control on smoother surfaces, however, you’ll be inclined to choose a stiffer, sportier chassis setting, while exploring the superhuman grip for which the quattro system is synonymous. You’ll be congratulating yourself, too, for specifying the all-wheel steering, as it really does sharpen response and agility (and reduces the turning circle by more than a metre), despite this being offset by a helm that’s too light to be genuinely informative. Find a rhythm on a long, sweeping ribbon of tarmac, though, and that’s when the A7 magnificently and joyously comes into its own. For on cross-country dashes you really can make this car fly, which is just as it should be for a machine whose capabilities as a large, spacious and continent-crushing grand tourer have by this time become unarguably evident. And how very convenient, because here we are at the southern tip of Africa, with a vast mass of land stretching far away to the north. Next stop, Johannesburg anyone? Hey, we’ve got just the right wheels for it – game on! A Hong Kong resident for more than 30 years, Jon has worked on publications devoted to culture, travel and lifestyle, as well as a short stint in daily newspapers, since the late ‘70s. He loves travel, literature, jazz, wine, aircraft and, especially, motor cars – and has occasionally been known to knock together a reasonably edible meal.